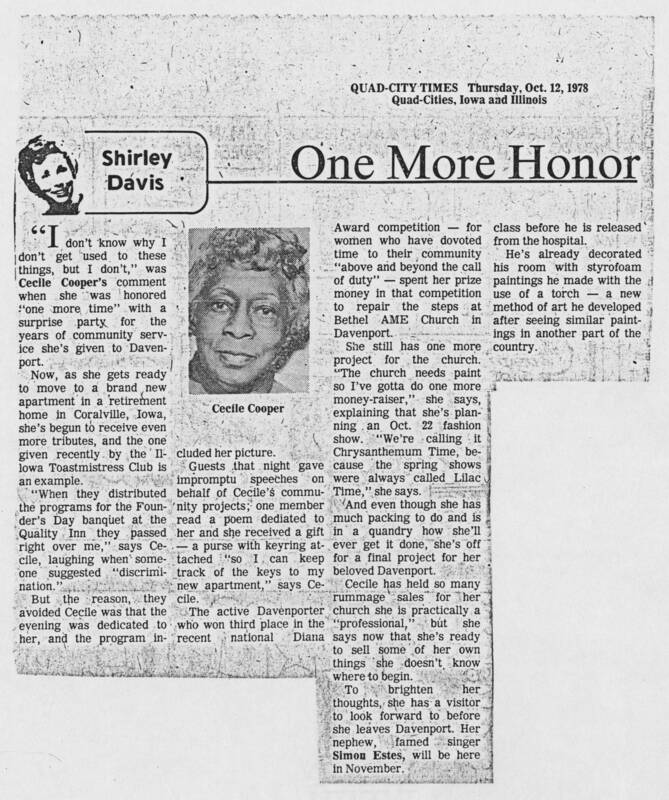 DIY History | Transcribe | Social Justice | Cecile Cooper newspaper clippings, 1964-1998 | 1978-10-12 Article: ""One More Honor""
1978-10-12 Article: ""One More Honor""
“I don’t know why I don’t get used to these things, but I don’t,” was Cecile Cooper’s comment when she was honored “one more time” with a surprise party for the years of community service she’s given to Davenport. Now, as she gets ready to move to a brand new apartment in a retirement home in Coralville, Iowa, she’s begun to receive even more tributes, and the one given recently by the Iowa Toastmistress Club is an example. “When they distributed the programs for the Founder’s Day banquet at the Quality Inn they passed right over me,” says Cecile, laughing when someone suggested “discrimination.” But the reason, they avoided Cecile was that the evening was dedicated to her, and the program included her picture. Guests that night gave impromptu speeches on behalf of Cecile’s community projects; one member read a poem dedicated to her and she received a gift- a purse with the keyring attached “so I can keep track of the keys to my new apartment,” says Cecile. The active Davenporter who won third place in the recent national Diana Award competition- for women who have devoted time to their community “above and beyond the call of duty” – spent her prize money in that competition to repair the steps at Bethel AME Church in Davenport. She still has one more project for the church. “The church needs paint so I’ve gotta do one more money-raiser,” she says, explaining that she’s planning an Oct. 22 fashion show. “We’re calling it Chrysanthemum Time, because the spring shows were always called Lilac Time,” she says. And even though she has much packing to do and is in a quandary how she’ll ever get it don, she’s off for a final project for her beloved Davenport. Cecile has held so may rummage sales for her church she is practically a “professional,” but she says now that she’s ready to sell some of her own things she doesn’t know where to begin. To brighten her thoughts she has a visitor to look forward to before she leaves Davenport. Her nephew, famed singer Simon Estes, will be here in November. He’s already decorated his room with Styrofoam paintings he made with the use of a torch – a new method of art he developed after seeing similar paintings in another part of the country.